Is Your Energy Bill Increasing? If you have noticed an increase in your energy bill the problem could be poor home insulation. 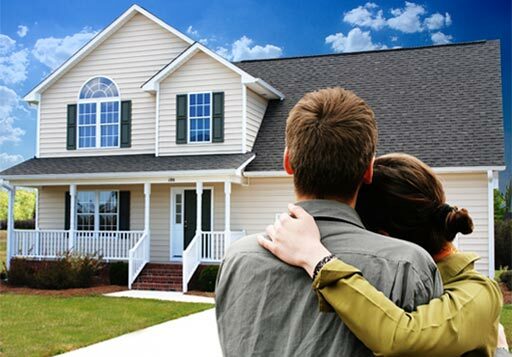 Consider updating to spray foam or radiant barrier insulation and increase the value of your home. Spray Polyurethane Foam (SPF) is an insulation and sealant like no other. It can form a continuous air barrier on walls, roofs, around corners, and on many surfaces in and around a home or building. It is created by mixing two liquids that react very quickly, expanding on contact to create rigid foam. It not only insulates, but seals gaps, and some foams can form a barrier against moisture and vapor. By creating a tight barrier around a building, SPF helps prevent hot and cold air, moisture and vapor from infiltrating a building’s comfortable interior environment. SPF insulation is known to resist heat transfer extremely well, and it offers a highly effective solution in reducing unwanted air infiltration through cracks, seams and joints. Reduce energy consumption by helping prevent hot and cold air infiltration. Create a comfortable indoor environment, by preventing allergens and moisture from entering the building’s interior. Provide additional building strength, including resistance to wind uplift. Offer design creativity and flexibility by fitting hard-to-reach places or complicated structures, such as domed ceilings. Radiant barriers, also referred to as “radiant barrier insulation” and “reflective insulation” work to reflect heat energy back toward the source. Radiant barriers are made of a highly reflective material that reflects rather than absorbs radiant heat and they work by reducing radiant heat transfer from the underside of the roof to the other surfaces in the attic. To help protect the interiors of cars from the summer heat, you may have noticed foil-surfaced sun shades acting as radiant barriers placed on the windshields of cars. 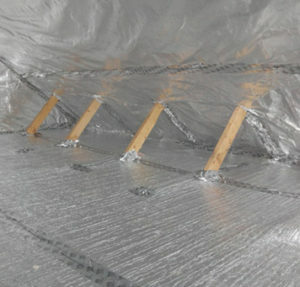 In an attic, radiant barriers installed between roof rafters and walls work similarly to a car’s reflective sun shade. 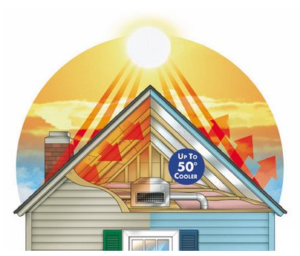 Radiant barriers are effective at cooling attic and home temperatures, thus reducing cooling costs in warm seasons. Reduces the radiant heat transfer from the underside of the roof to the other surfaces in the attic. May reduce cooling costs by 5-10% when used in a warm, sunny climate. The reduced heat gain may even allow for a smaller air conditioning system. We insulate both interior and exterior foundation walls, interior walls, ceilings, or floors. 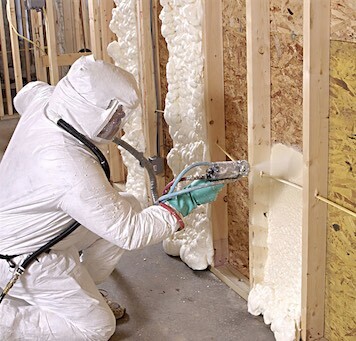 We even offer spray foam insulation during all 12 months of the year due to our heating procedures and we use polyurethane closed cell foam for spray application.All of our barriers and liners are class A fire rated as well as antimicrobial (will not support mold growth). 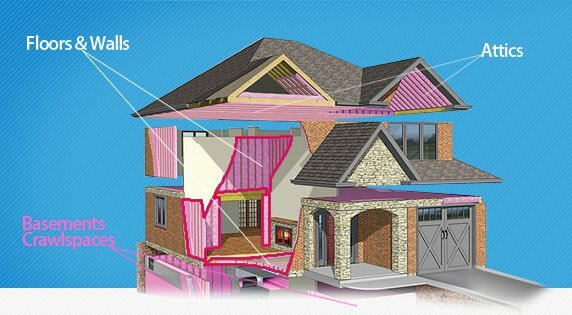 We specialize in spray foam insulation but also install foam board, rolled, and batt insulation and carry several different brands of products to choose from. Foam board insulation is moisture resistant and is best for concrete floors and interior/exterior foundation walls, and rolled or batt insulation is best for interior walls and ceilings. Spray foam, is best for all insulation needs as it is moisture resistant. We perform both removal and replacement and take the same precautions as our mold removal process when removing bad/old insulation. At Pollution Solutions we feel the right insulation for a basement, crawlspace, or attic may make a big difference in your monthly household energy costs. 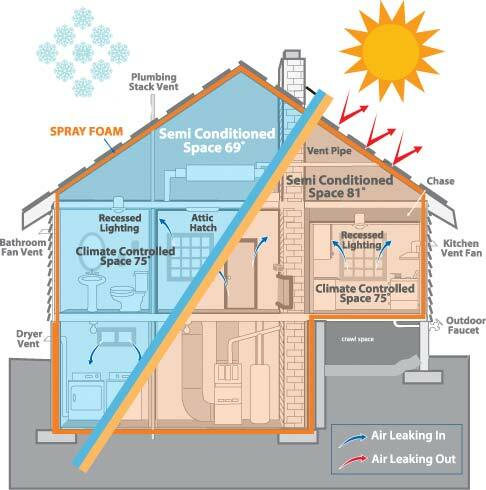 In fact, spray foam insulation could save you up to 40% off your heating and air condition bills! Not only will you be actively playing a part in minimizing global warming (by using less energy) your home will also take on the qualities of a cool box or a thermos — by keeping the cool air in for a longer time during the summer and warm air in for longer during the winter. We can help you with all of your insulation needs and look forward to saving you a ton on your energy bill!